Decision Matrix is capable of capturing uncertainty in an option. Say, you have received a job offer which offers a good salary but very far from your home. You will have to drive almost 2 hours just to go there. You know that you can turn down this offer and wait for another better offer. But if you turn down and wait for a long time, you may get frustrated and eventually take an offer which can be worse than the current offer. What should you do? Clearly, there are uncertainties. Your objectives are to Maximize Salary and Minimize distance from home. 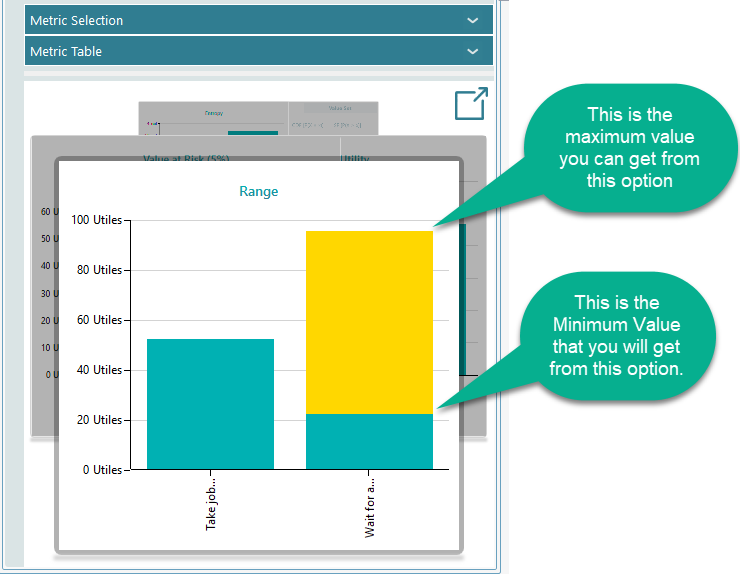 You can model these 2 objectives as shown in the Getting Started with Decision Matrix page. Anyway, say you have modeled your objectives and options as shown on this page. Now, select the option "Wait for a better offer". You assume that, if you wait for an offer, you may end up taking a job that offers salary from 80K $ to 120K $. You can use a Probability distribution to model that range. Based on the market and your skill/experience, If you are confident that, most likely you will get a salary of around 100K, possibly a Normal Distribution can fit this uncertainty. 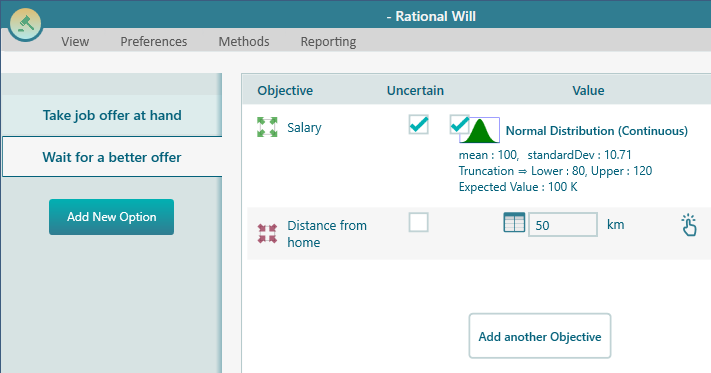 Check the Uncertain Checkbox on Salary in "Wait for a better offer" option. 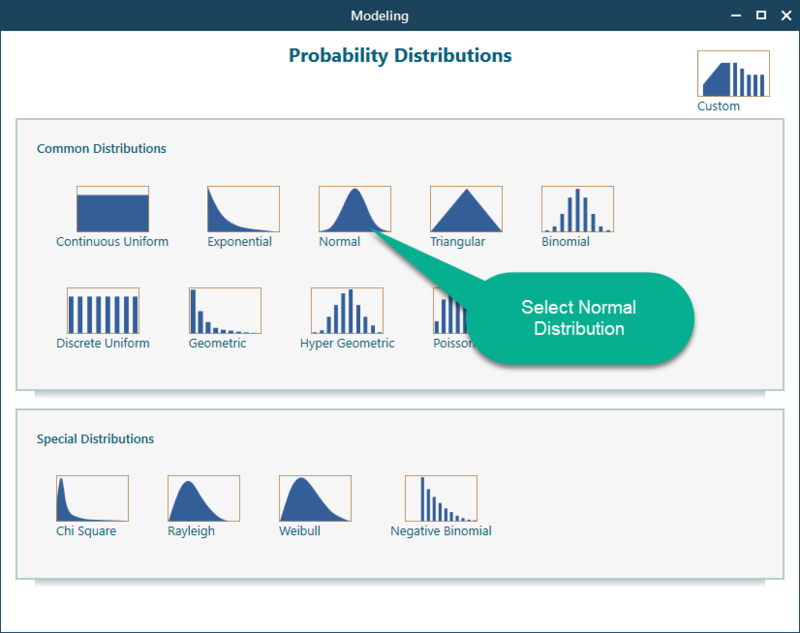 Then click the Probability Distribution button as shown in the following screenshot. 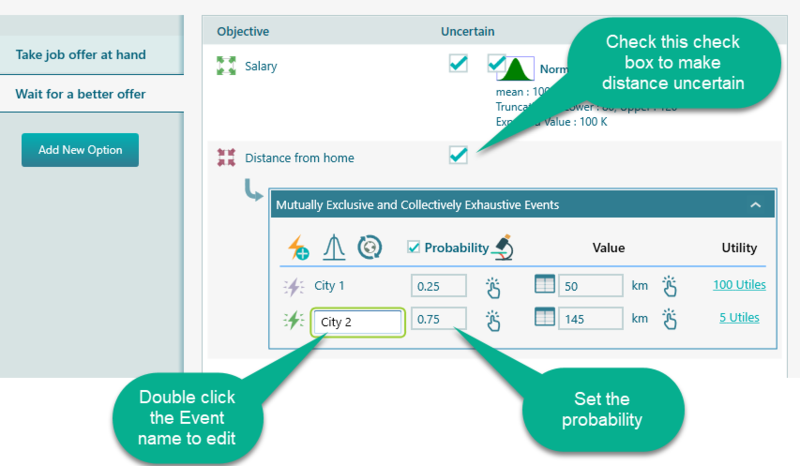 Once you click that Probability Distribution button, the Probability Distribution dialog will open. Select the Normal Distribution from this gallery. 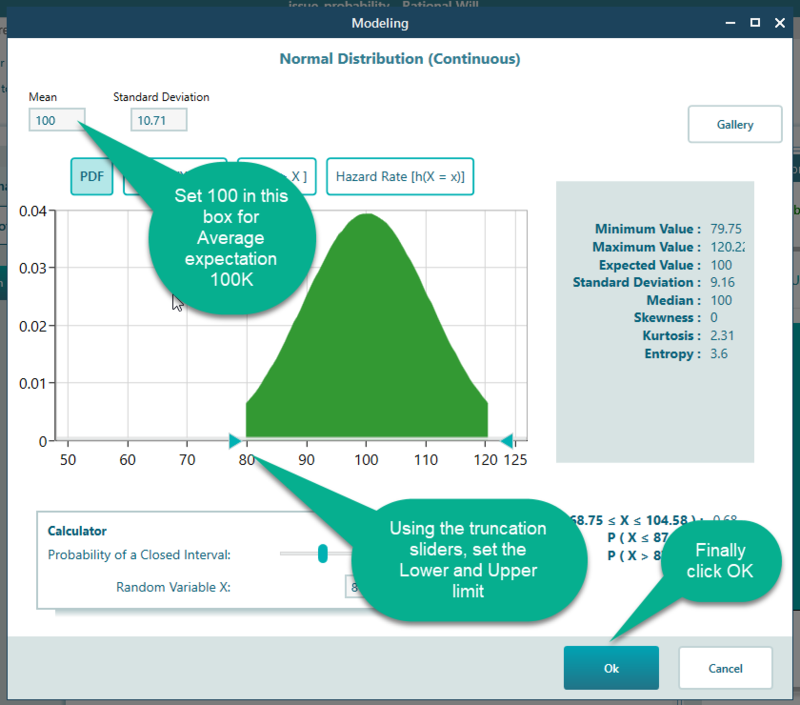 Once you select the Normal Distribution, you will see the normal distribution shows a range of 50K to 125K as it was set by you in Objective editor. Set the Mean = 100, set the lower and upper limit using the Truncation sliders, and Click Ok.
Once you click OK, the options screen will look like this. Also, the distance from home in your new job can be within 2 defined distance. I mean, say your job can be within City 1 or City 2. City 1 is 50km distance and City 2 is 145 km far. Lets model these 2 events. Click the Uncertain Checkbox for "Distance from home". Say you believe that, 75% probability is that you will get the next job in City 2. You can specify that probability as well. Now, it is time to analyze the risk profile and come to a conclusion. From the options analyzer, you can get lots of insights about the situation. The Risk Profile chart shows the possible range of utility values you can expect from the uncertain options. The Risk Profile is generated using Monte Carlo Simulation. You can see that, based on "Maximize Expected Utility" strategy, a recommendation is made for you, which is "Take the job offer at hand". Also, you can see that the "Expected value of Perfect Information" is also calculated in terms of Utiles. Notice that, the Stochastic Dominance is also calculated and shown here. "Take job offer at hand" dominates the option "wait for a better offer" by Second Order Stochastic Dominance. 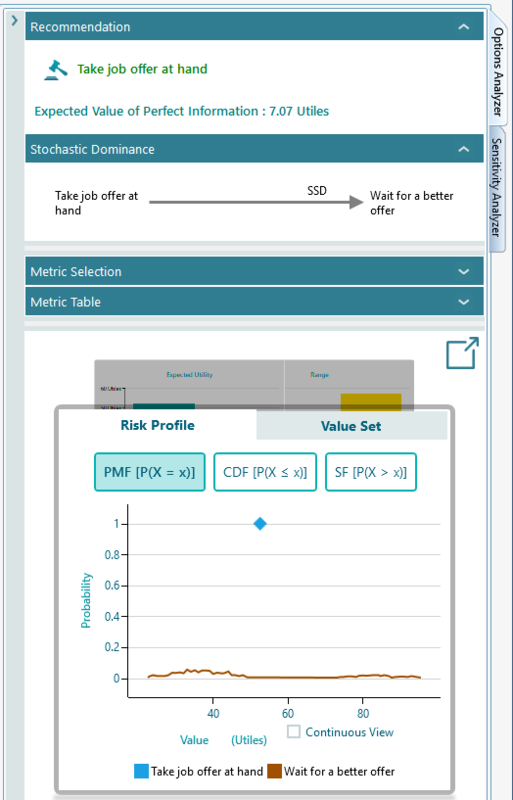 You can analyze lots of other risk-related metrics by expanding the "Metric Selection:" panel. 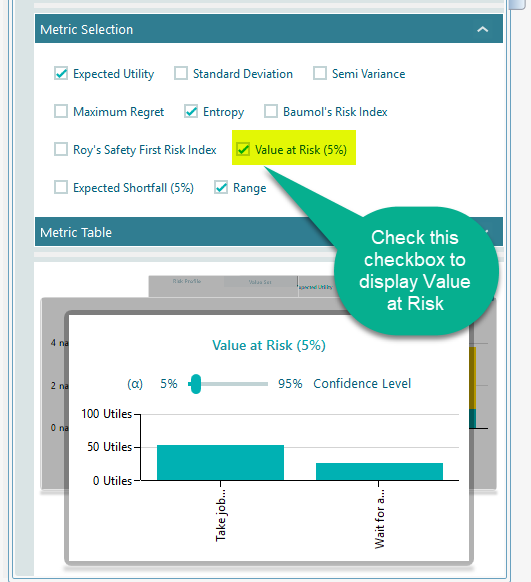 For example, the Value at Risk metric is displayed by checking the checkbox as shown below. In the carousel, you can browse lots of perspectives. One of the important insight you can get from the Range chart. Notice that, "Take job offer" has a certain utility value. Wait for a better offer can range from a much lower utility value to a much higher utility value. Looking into this range, you can take a better decision about your affordability of risks.